SEO had a big year in 2017. Google started the year by announcing the websites that had too many interstitial ads and popups (See more). New search engines for Alexa, Siri reached heights. Google gave more focus on websites with https, in fact, displaying 50% of results on the 1st page having https. Then Google Fred (anything that’s un-named, is Fred, according to Gary Illyes). Google’s constantly increasing the Featured Snippet, penalizing pages with more interstitial ads, and rewarding pages with good content and links. The following updates are most likely to happen in 2018, considering various signals they’ve been giving recently. RankBrain has been in action since 2015. It’s the reason why you get ranked in higher position in Google, despite having similar contents in big sharks like Facebook, Twitter, and directories like Yellow Pages. Rank Brain is an AI developed by Google which measures the user interaction with the search results. In other terms, it rewards the page if it’s SERP is loved by the users, and penalizes the position if people don’t love it. The algorithm checks two things: Dwell Time and Click Through Rate. Dwell Time is one of the most important factors measured by RankBrain. The longer people stay on your website, the more useful Google thinks your article/website is. In fact, According to a ranking factor survey by Searchmetrics, the average time on site for top 10 URL is 3 minutes and 10 seconds and is the second most prominent ranking factor according to Semrush. Sudden ranking changes are seen on Google as well. This is usually due to higher Click Through Rate. If more people are clicking on your website, then Google believes, according to RankBrain, the website is important and upranks the website. Webmasters have been tricking Google with the artificial boost in CTR and Dwell Time. While Google’s RankBrain comes up with measures to tackle this, they will definitely improve the RankBrain in 2018 to make sure that what’s valuable and loved by people stays at the top. Google has been making a lot of changes in Featured Snippets. Like we discussed earlier in 2017, Google’s been testing Best Result Answer Snippet for both desktop and mobile devices. Google also confirmed that they are testing to remove the organic search result for those sites which appeared in Featured Snippet to Search Engine Land (SEL). Here’s a preview provided by SEL on how the results looked before the test. After the SERP was removed, this is how the result looked like. Although these tests were still under process in 2017, they are likely to be rolled out by mid 2018 and thus opening one extra position for organic results in 1st page. In 2016, Google announced that they have started to index mobile-first. This is done considering that most of the Google searches come through mobile devices due to its accessibility. This means that Google will consider the mobile version of your website even if you are searching from the desktop. We understand this is an important shift in our indexing and it’s one we take seriously. We’ll continue to carefully experiment over the coming months on a small scale and we’ll ramp up this change when we’re confident that we have a great user experience. Of course, this hasn’t been live to full extent, and it is still to grow from its larvae stage. That is why it is necessary to get prepared and ready when the update is fully live to avoid penalties. Backlinkto offers a thorough guide on how to get prepared for this update. My take? It’s going to happen way sooner. Considering the developers are hiding things in mobile to look it better, this sometimes involves in unjustified ranks. Google’s algorithm still looks at the desktop version of page’s content to evaluate the value it provides to the user. However, this causes issues when the mobile version has less content that desktop has. So it is pretty much sure this update is going to affect a lot of sites which still depend on m. version and has different page content for mobile devices. This should be on the #1 list considering how large the market the voice search is going to take. With the invention and development of various voice assistant, it’s not wrong to say that voice search is taking over most of the searches from mobile. And it’s only logical that it is so easy to say “Ok Google” or “Hey Siri” instead of going to your browser to search for something. According to Google, 55% of teens and 40% of adult uses Google Search on their mobile devices. Voice search is easy compared to type-searching, considering it is hands-free, and more importantly it works so well. Google has improved its voice recognition and its word error rate has dropped to 4.9% in 2017, compared to 23% it had in 2013 and 8% in 2015. With these facts of voice recognition on the mind and considering Google owns the biggest search engine in the world at the moment, they’ve been constantly investing in merging the voice recognition with the search engine and they’ve done a pretty good work at it. From the SEO Point of View, the voice search is about the way people search for their query in Google. Instead of looking for “SEO Company”, people ask for “What is the best SEO Company in Melbourne” or even “What is the best SEO company in my area”. Firstly, the contextual search has been improved by a lot since Hummingbird started. On the other had, it is necessary to understand with what intentions are the people searching on Google through voice search. They’re looking for quick answers, rather than getting a page full of unnecessary and vague content. Thus it is necessary to make sure that you’re optimizing the page properly by providing the exact answers to various thing’s you have covered in the page or article. The voice search will probably be fully operational in this 2018 and we can expect more voice search this year. My take is that it will increase from 55% to 65% – 70% this year. It’s recommended for you to target for the long-tail keywords too while writing contents for an article. Okay, we already know that Apple has Siri, Amazon has Alexa a.k.a. Echo and Samsung have Bixby. Although Facebook’s M discontinued this year on January, there are still big giants who are heavily investing to improve their AI bot for devices. In fact, there new virtual assistants will be improved by a lot. As we discussed earlier that the word error rate for Google has dropped significantly, these virtual assistants like Siri, Alexa, Bixby, etc are going be at their peak. 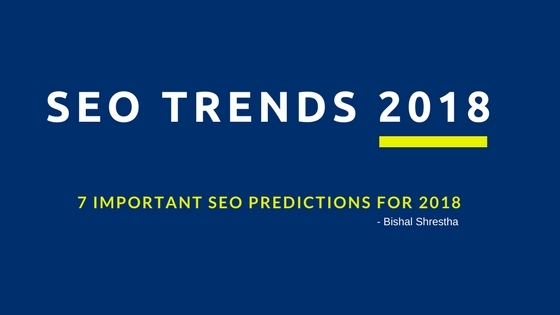 This will open a new prospect for expansion of SEO beyond the two search engine giants. Google has been investing in AI to build machine learning systems for a while. From displaying the Satellite imagery into viable maps, from using the machine learning in Youtube to create the captions in over 10 languages automatically, there is no doubt that the big tech giant company’s AI is doing great. Google Lens, which lets you search images by photography, is something that is going to be large this year. New Schemas will be created for the developers to make it easier for the machine to learn the images from their website. Our take is that Google Lens is going to get started. However, it might take few more year for the photography search to go boom. Thanks to AI, websites get better online exposure for their content. So I believe many companies rely on content marketing and pay less for paid links campaigns. Single Keyword ranking become less effective in 2018, but long tail key phrases become trend. I hope search engine algorithms will be modified so that negative SEO loses its effectiveness. We already know that Google has been adding a lot of Schemas recently. The meta description length has been increased at the end of last year, thus opening a new prospects for the whole set of snippets. They are testing new Featured Snippet answer schema which was seen earlier by SEO Roundtable. There is an extension process in Schema.org which allows the user to submit their custom schema for their industry. Last year, in 2017, new schemas were added in Finance Industry (FIBO Schema), and “Howto” schema was added to Schema.org. How do I generate Custom Schema on my Website? There is something that very fewer people knows of and something that is not mentioned in Google’s Structured Data guide. I’ve tested if I can make Google understand that my data on the website is important. I’ve tested on this site and a few months later, I could see this update in Google’s search. To generate a custom schema like the one I did above, all you need to do is have a table and put the important data inside it. Once Google starts recognizing that the information is important, they will show up the custom knowledge panel/schema for your site. This is something that will generate a good impact on people who finds your business on Google. This is not something new, but my point here is that there are a lot of possible ways new schemas can be generated. With Google adding a new schema, and a lot of developers and SEO Experts experimenting on this, there will be an expansion of Schema on a wider industry. SEO is a booming industry and with new prospects for expansion of SEO beyond Google and Bing, there is going to be more of expansion of the search base and more data will be processed this year. More Voice searches, Mobile-First Update, Custom Schema, Improvement in RankBrain are some of the top improvements that we can expect this 2018. Bishal Shrestha is an SEO Manager and Growth Strategist at Xugar Design. He has expertise in Digital Marketing and been in this field for more than 2 years. Apart from being a Tech Geek, he is a software engineer who has specialized in Java and Web designing.